After the Cubs suffered a bit of a let down on Thursday, they came right back to beat Ian Snell and the Pittsburgh Pirates 3-2. Rich Hill got the first win for a lefty starter this season and the Cubs were able to do just enough to get past Ian Snell. Hill, who confidence was in the dumps, was able to give the Cubs five innings, giving up one run on three hits and three walks with four strikeouts. It was another stomach turner for the Cubs. Hill walked the first batter he faced, Nate McLouth, on four straight pitches. Luckily he was able to calm down. The offense also struggled in the beginning of the game. The Cubs had runners in scoring postition in the first, second, and third innings and failed to score a run. The worst of these blown opportunities was in the bottom of the third. 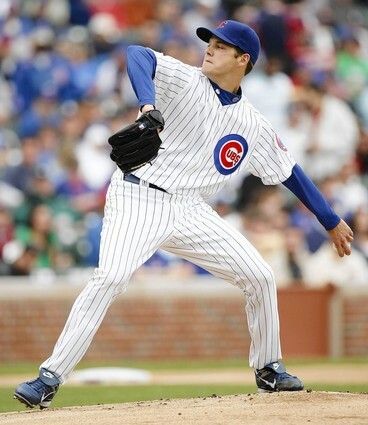 The Cubs were down 1-0 and had one out in the third when Ryan Theriot hit a triple. With D-Lee and A-Ram coming to the plate, it looked like the Cubs would be able to tie it, but Lee grounded out to the pitcher and Aramis flied out to right. It looked like it was going to be one of those days. But Fukudome led off the fourth inning with a triple. Mark DeRosa singled, tying the game, and then Geovany Soto hit a double, putting runners at second and third with no outs. Boy, when Soto is out of the lineup, it really hurts the Cubs. Reed Johnson hit an infield single, scoring DeRosa and giving the Cubs the lead. For the second day in a row, there was a mix up with the signals, and Rich Hill grounded into a fielders choice instead of bunting, but Eric Patterson hit a ground ball to short, allowing Soto to score and give the Cubs a 3-1 lead. That insurance run would be the difference in the game. came out to pitch the sixth and struck out the side. Then, Lou had him go back out in the eighth, and Marmol ran into some trouble. McLouth led off the inning with a solo home run, making it a one run game. He got the next two batters, Luis Rivas and Freddy Sanchez out, but then walked Jason Bay and gave up a single to Xavier Nady. With the winning run at second and two outs, Marmol got Adam LaRoche to strike out swinging. 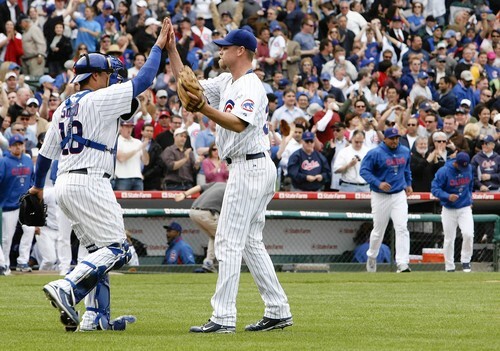 Kerry Wood came out and pitched a 1-2-3 ninth to get a new winning streak started. Let’ see if the Cubs can beat Tom Gorzelanny for the second time this season. The Cubs will be sending Jason Marquis to the mound. Two bits of Lou news that I thought was worth noting. First off, Lou will have Reed Johnson bat lead off. Good to see Lou is reading Crawly’s Cub Kingdom!! With Fontenot, Theriot, and Patterson not doing much at lead off, it will be nice to see if Johnson can set the table for the big boys. Johnson has six hits the last two games and is hitting .375 for the season. “Marty’s a Cincinnati guy, obviously he’s rooting for the Reds. But I don’t think our fans are obnoxious. They get into the ballgame, they enjoy coming out to a ballgame and that’s why they draw here the way they do. It’s a fun environment and they get into it. “As far as winning the division — hey, I like Marty Brennaman, I really do, I was over there for three years — but he has nothing to do with the Cubs winning or losing, I can tell you that,” Piniella said. Put that in your Depends and smoke it old man. Mark DeRosa also weighed in on Brennaman’s comments, and either knowingly or unknowingly hit the nail on the head. “I don’t want to get into a war of words with him,” Chicago’s Mark DeRosa said. “I respect how he handles his profession, but I didn’t agree with what he said. I think he could’ve used different wording. 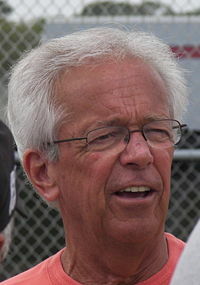 There are probably tons of reasons that Brennaman has deep seated hatred towards Chicago. He probably is still bitter his son Thom (nice spelling Marty) was not being moved quicker up the ladder at WGN and that Harry Caray was pushing to get his grandon Chip into the booth. Marty was always jealous of Harry and his popularity. Let’s go for two in a row tomorrow.